Whether it’s a storm, emergency situation or just the water running through your kitchen faucet, there are quite a few Midland laborers who make their living making our lives safe, comfortable and able to function with ease. Often working behind the scenes and out in the elements, there are several departments within the city and county that make our community run as best as it can. Here is a look inside three of the roles that function to make your everyday life safer, easier and cleaner as a result. For some people, retirement means leaving the workforce and entering into a new phase of life. For Carl Doud, it means something else entirely. After spending 20 years in the military, first in the Air Force and then in the Navy as a medical entomologist, Doud retired and moved onto something completely different – but also similar. Medical entomologists in the service work to prevent the spread of disease related to mosquito and tick-borne illnesses. 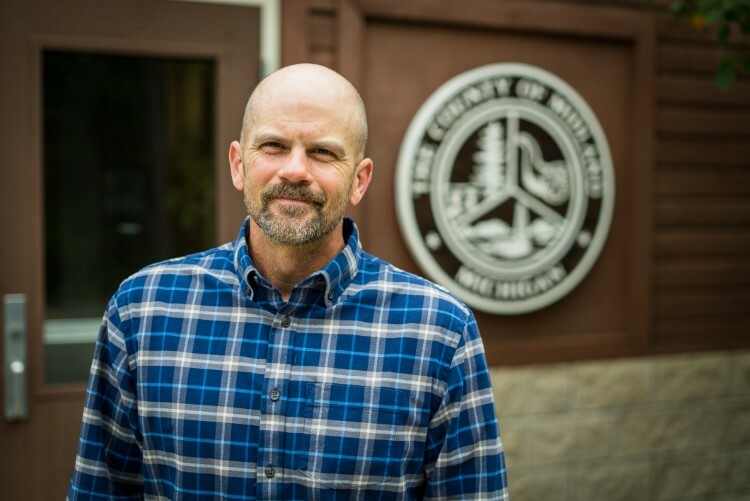 Doud now spends his workday as the Director of Midland County Mosquito Control, where he has worked for nearly four years. Carl Doud, Director of Midland County Mosquito Control. Managing mosquitos in all of Midland County is the job, but for Doud it’s really about the people. He has thirty employees, most of whom are seasonal and part-time workers. 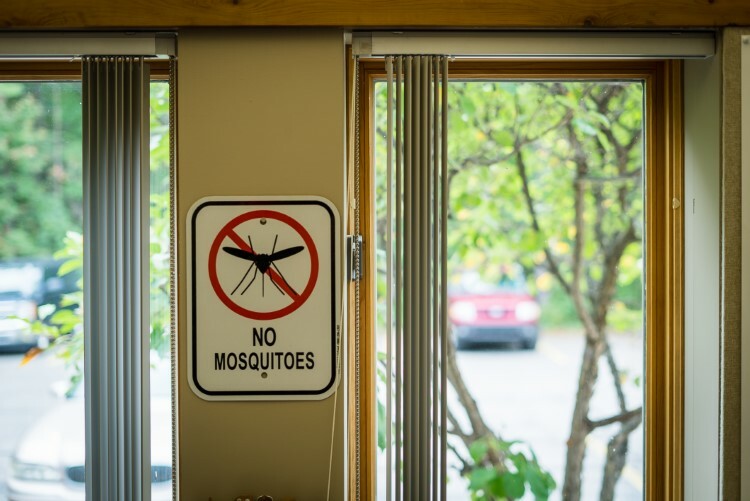 Inside Midland County Mosquito Control. When nature takes hold and gives Midland high amounts of rainfall, Doud’s crew runs hard around the clock to make sure they are not only treating larvae, but also treating for adult population control. Sometimes this means operating the fog trucks that you can see driving through the county, but workers also do less visible work by treating standing water while on foot. Kimberly Tozier, a staff member at Midland County Mosquito Control gets ready to spray an area of standing water. Slogging through mosquito habitat comes with a lot of water, and sometimes the gear worn by workers isn’t enough to protect them from getting boots full of water. Most of Doud’s employees keep an extra set of clothes with them, as they inevitably find themselves moving through water or mud. Consider walking through muddy, bug-filled sludge water and you can easily picture the need for dry clothing. 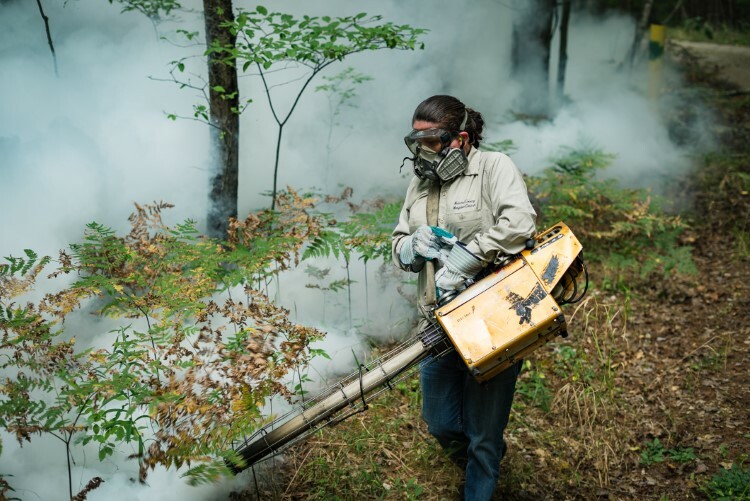 Kimberly Tozier spraying a wooded area in Midland County. 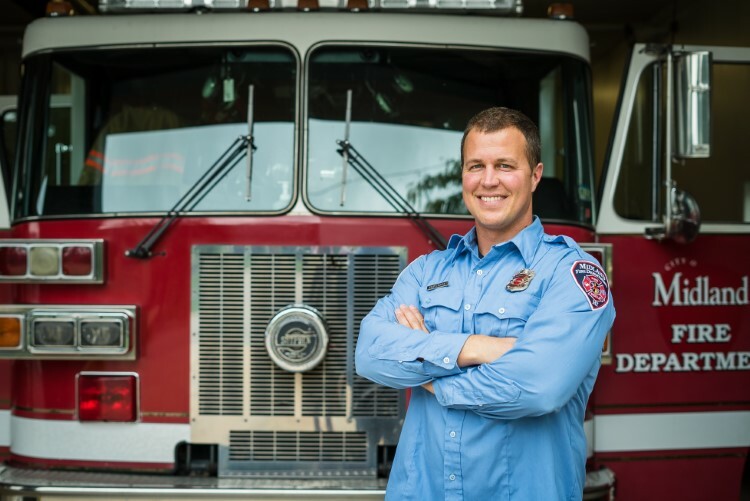 Mickey Mason has been with the City of Midland’s Fire Department for ten years. The last two of those he has been faithfully driving the big red truck that so many people know and love. As a Station 3 Fire Truck Operator, Mason’s favorite part is not only driving the truck, but being a part of the Station 3 team. Mickey Mason, Midland Fire Department Station 3 Fire Truck Operator. All Midland fire stations operate on a 24-hour shift schedule. The days of a firefighter at Station 3 are long. They work twenty-four-hour shifts, and going in at 7:30 in the morning means you’re out of work at 7:30 a.m. the next day. After three day-on and day-off shifts comes a four-day break. With schedules that demanding, having great teamwork as a station is instrumental to keeping a healthy attitude. One of the firetrucks inside Midlands Station 3 which is ready at a moments notice. 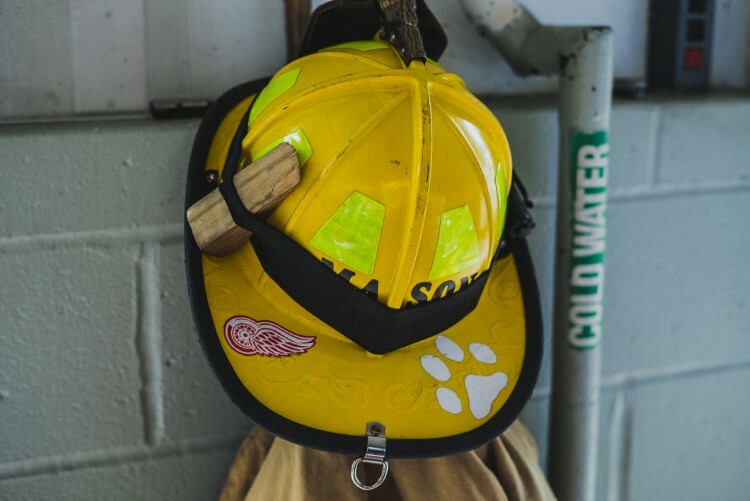 Being a firefighter comes with the usual amount of dirt and soot that any burning building can bring, but the most challenging part of the job for Mason is challenging himself. He must be ever-ready to take on any call that comes to the station. 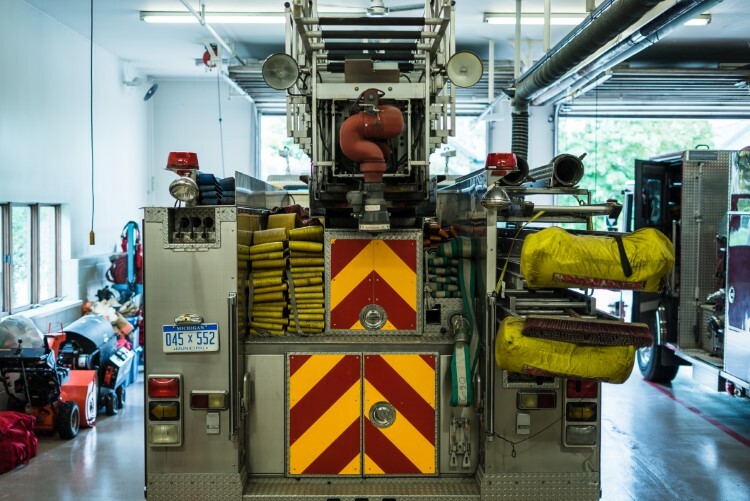 Midland's Fire Department goes on many other emergency calls aside from fires. Being prepared doesn’t always mean taking a fire-related call. When a person calls 911, central dispatch decides whether or not to call the firefighters in. 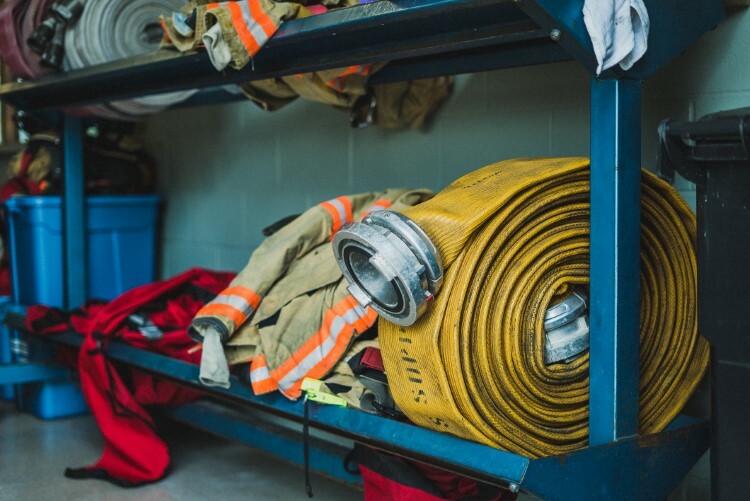 There are three stations for the city, and calling Station 3 might mean using the ladder company, the technical rescue team, a hazmat team, or even sending out the boat for water emergencies. When an ice rescue happens? That’s the fire department. Wayward fisherman stuck in a perilous dam? The fire department comes to the rescue. Being first on the scene can often mean making discoveries that no person should have to make. “There are a lot of things you see that you wish you hadn’t, but you are able to affect someone’s life for the better, and there are just as many positives that allow us to help the city and help the people that need us,” says Mason. Jennifer Christensen is in the Utility Maintenance department with the Wastewater Treatment facility for the City of Midland. In her role since 2005, she has seen quite a few interesting things come out of (or go in to) a drain pipe over the years. Jennifer Christensen from the Wastewater Treatment facility for the City of Midland. Christensen notes that the best part of her job is helping others when issues arise. 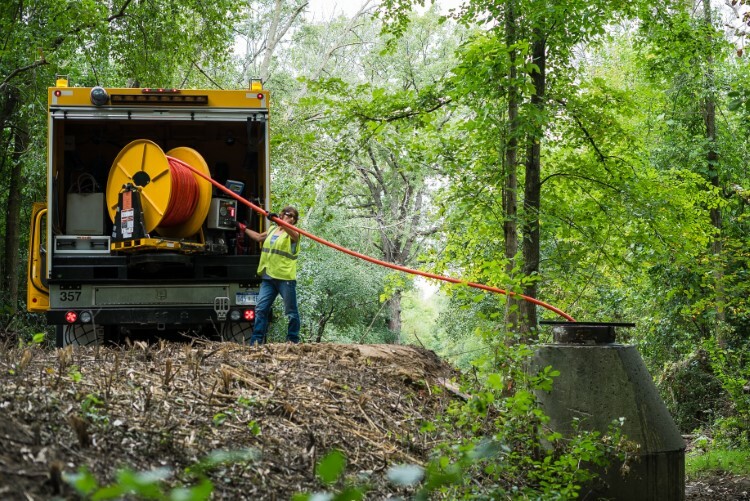 “It’s really rewarding when I can help residents with drainage problems. We play a role in getting their life back to normal and that is something I really like assisting people with,” she says. 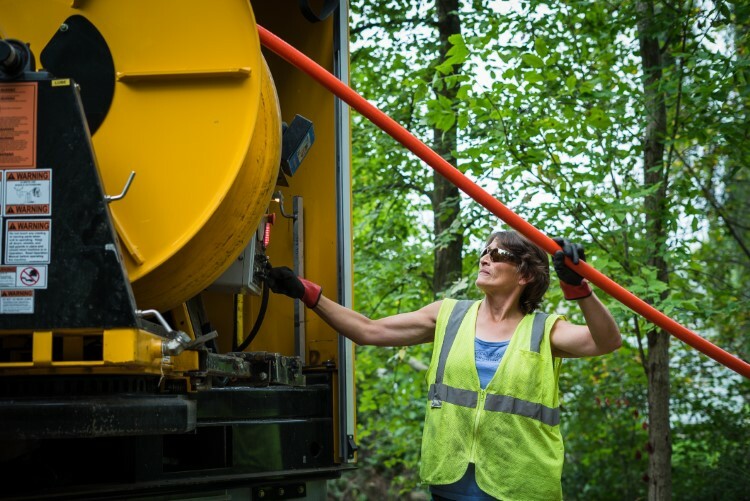 Christensen feeds hose from the water treatment truck as part of routine maintenance. Issues with storm drains and water treatment are definitely a hands-on task. Midland residents might be surprised to hear that most issues with drains require workers to go down in them. Christensen monitors the controls during routine maintenance. The job takes her out of the city as well, the day we caught up with her crews were working back in the woods down a two-track near the Mark Putnum Trail at the end of Longview Street. 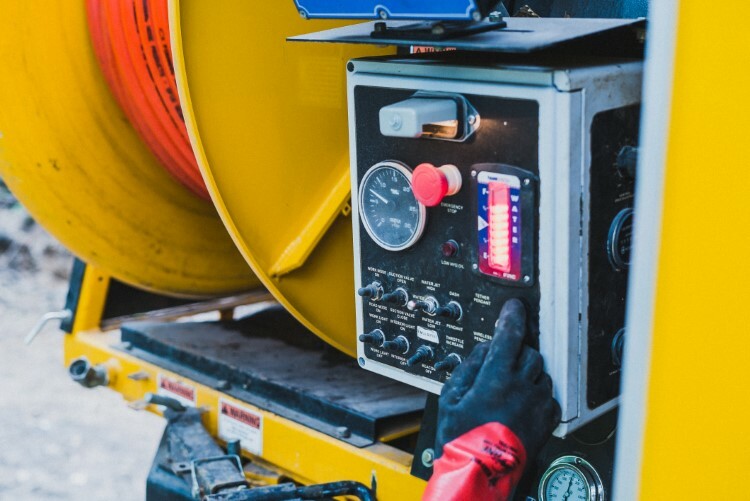 Sometimes routine maintenance of the sanitary sewer takes crews outside of the city, depending on where different access points are and often involves clearing debris out of nearby areas. Christensen in the woods doing maintenance on a drain pipe. She has come across 20-30 raccoons in the drain systems, which often are scared and scurry away quickly. A few dogs have also wandered and fell into storm drains when they were being worked on, but all have been safely removed and helped out by workers and owners.